The mayfly with the funny name is one worth knowing when it comes to fishing in the late summer and early fall. Actually, all mayflies have funny names, but most, over the years, have become known by some common name such as Light Cahill, Sulfur, March Brown, or Quill Gordon. But the Isonychia still proudly boasts its Latin name. Sure, there are those who might refer to them as Mahogany Duns, Slate Drakes, or even Leadwing Coachman, but none of those names ever stuck. 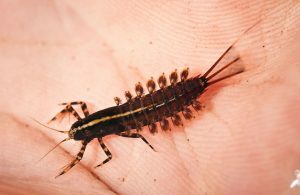 Probably the main reason is that those common names refer more to this insect in its adult stage, but to the trout (and trout fisherman), the nymph is by far the most important stage of this insect’s life. Isonychias, or Iso’s as some call them, don’t behave like most other mayflies when they hatch. Most mayflies will emerge to the surface and hatch in the water near the surface film. After hatching, they are often on the surface for a small amount of time, allowing their wings to dry before they fly off. This leaves most mayfly adults vulnerable to hungry trout and is the stage of the lifecycle that many dry flies represent. But Iso’s behave more like a stonefly. The nymphs swim to rocks or woody debris and hatch out of the water. The trout never get a shot at the adult until it later returns to lay eggs. Take a closer look at exposed rocks in or around the stream this time of year and you’ll likely see some of their empty shucks. In the Smokies, they typically hatch from August through October with peak emergence in September. 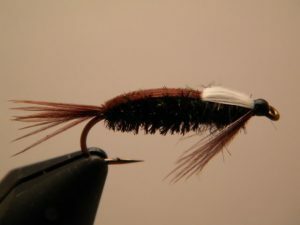 If you want to try your luck imitating them with dry flies, try a dark bodied parachute in size #14-12. The body color will typically be anything from a deep mahogany to dark grey or even black. A good ol’ Parachute Adams is probably as effective as anything. When they return to the water to lay eggs (known as the spinner stage), their body color is more orange or rusty. However, as mentioned above, the nymph is what you should be most concerned with. Also in sizes #14-12, the nymph is slender with a dark brown to black body. It has a very distinct white stripe down the back. You will sometimes find specific Isonychia nymph patterns but they are imitated well with common patterns. Prince nymphs or Zug Bugs are a couple of favorites. The late Eddy George was a well-known and highly respected fisherman and fly tyer in this area. He is probably best known for the George Nymph, a fly that I regularly tie and fish in the Smokies. Many people speculate what this fly might represent. With its slender, dark body and white poly-yarn back, it’s incredibly effective during Isonychia time! Dark soft-hackled wet flies are very productive, too, as Isonychias are active swimmers and tend to be most active in the mornings and evenings. Any time of day is a good time to drop one of the above fly patterns off a dry fly. Early and late in the day, try fishing with one or a pair of these nymphs. Vary your typical dead-drift presentation to offer the occasional twitch or even swing. Check out the Active Nymphing article in this newsletter for more on that presentation. Learn more about Smoky Mountain hatches and flies in my hatch guide.